Raise your hand if you get started on cookies before they even hit the baking sheet? Confession: Both hands are waving high right now! In the great “cookie dough vs. actual cookie” showdown, as far as I’m concerned, #TeamCookieDough emerges victorious! For me, pre-tasting (as I like to call it) is the most delicious part of baking cookies. Which is why I usually reserve cookie baking for an occasion (so I can share) or when my daughter really wants to bake cookies and it’s been a while. Much like her mom, my daughter is devoted to team Cookie Dough. I dare say she’s more fervent about cookie dough than her mom. She’ll even have it in its separate components of flour, sugar, and baking powder – although she and I are not on the same page on that one. Now, I know cookie dough is not high on the healthy foods list. Okay, you’re right. It’s not on the list. So while I don’t encourage cookie dough eating I did want her to enjoy a treat that resembles cookie dough, except one that will nourish her body. 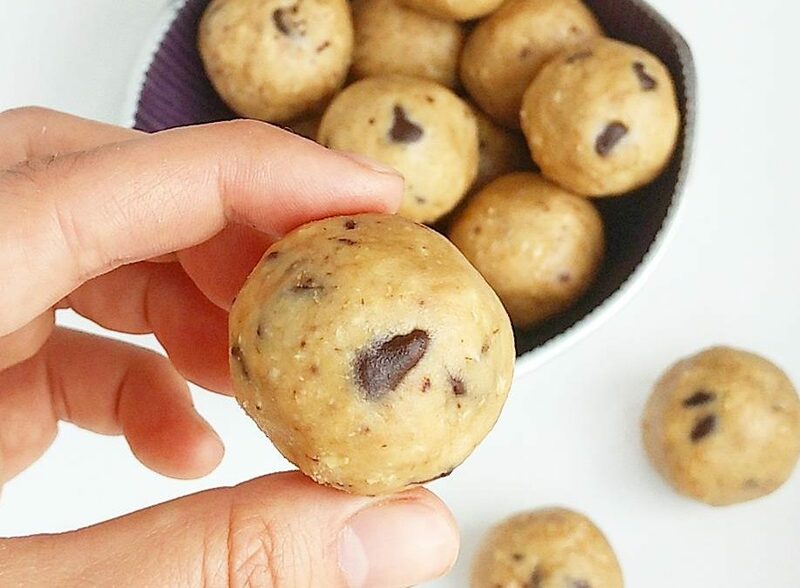 Enter Chocolate Chip Cookie Dough Bites. I had my daughter’s love of cookie dough in mind when I developed this recipe. I’m glad to say it’s a huge success! She loves them! And I didn’t even mind when she was picking from the “batter” when she helped me make them the second time (the first batch went fast!). That’s because the batter is mainly made of cashew butter and oatmeal. These treats are a perfect quick snack or dessert and will provide you with heart healthy fats and fiber. Personally, I love having them before a workout when I’m hungry and don’t want a full meal. They provide plant based protein and the energy you need to fuel your workout. GET IT! 1. Don’t bake when you are hungry. You are likely to think less and eat more on an empty stomach. Having a meal or snack before entering the kitchen will help you make healthy mindful decisions. 2. As soon as you are finished scooping the cookies onto the baking sheets, place the bowl and all utensils used directly into the sink and fill with water. Trust me, you won’t be so tempted to eat it once you do this. In a bowl, place all ingredients and mix until well incorporated. Roll into 1 inch balls. Chill for 1 hour and enjoy! * You can make your own by placing rolled oats into a food processor and blend unti reaches flour-like consistency. ** Use a brand that is free of food coloring.